What is the ExcellentShadow2 effect? How do I use the ExcellentShadow2 Effect in MikuMikuDance? How do I get rid of the ugly self-shadows in MMD? Hallo LearnMMD readers, it`s parkeerwacht with another article here on LearnMMD. In this article I will be explaining how the ExcelentShadow2 Effect by Minced works, and give a step-by-step instruction on how to use it. What is the ExcellentShadow2 effect? Wow that looks nice! Where can I get this effect? 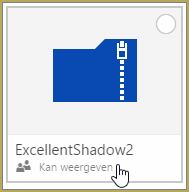 You can download the effect from Minced`s OneDrive DOWNLOAD THE FILE EXCELLENTSHADOW2! Graphics card that supports Shader Model 3.0 or higher. (optional) A High-End system is recommended. This effect may cause a lot of framerate drops, It may even on fast systems! Ok, so how does this effect work? I will explain how to use it step-by-step, how to use the basics of this effect. Step 1: Create your animation. Before we load the effect, it is a good idea to finish you animation first. Like I described before, this effect isn’t light on your system. That’s why you should finish the animation first. Open the archive you downloaded and extract it to the folder where you keep your effects. I named mine ExcellentShadow2. There is also a folder called ExShadowSSAO. Use the .x file in that folder to add SSAO to the shadows. This looks good in combination with the SvSSAO effect. This file must be loaded after ExcellentShadow2. This effect won`t work without the effect file loaded on a model. To do this, go to the effect mapping window of MME. Double click on the model you want to use the effect on. Then load the Effect file: full_ES.fx. If you are using a PMX model you must load full_ES_pmx.fx. MAKE SURE TO CLICK ON APPLY BEFORE CLOSING THE MME WINDOW! But does this mean I can’t use other effects on my model? Yes that is true, but our author Winky made an article about this: How to Add Multiple Effects on a Model. There is another way by editing the .FX files of those two. It is described in the Japanese Read Me file, but Google translate makes it hard to read the instructions. Basically what it says is that you can somehow merge the two together. However I haven’t got that to work and I have been using the tutorial above. If you use that, try and see what works best for you. I can tell you what I use for my video (Each video I use ExcellentShadow2 in uses a different combination, even for the same model. ), but my settings probably won`t work for you. It heavily varies on the models you use, the background/stages you use and the entire setting of your animation. 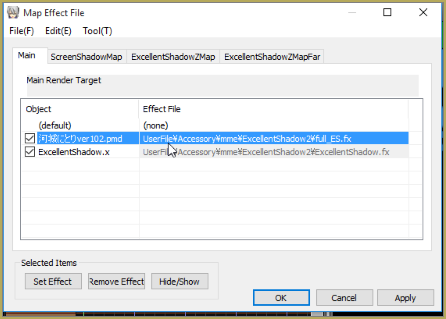 There also effects that have support for ExcellentShadow2 built in. As far as I know this is only the GreenerShader effect. You can edit the effect by adjusting the Si and Tr values. 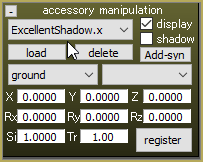 Si will change the amount that the shadows will be smoothed. This value can be anything from -100 to 100. Tr will change the brightness of the shadows. This can be anything between 0 and 1. The lower this value, the darker the shadows will be. Try and see which settings work best for you. That’s it, That is how you use the ExcellentShadow2 effect! If you have any suggestions, questions or feedback, please leave a comment. I will read them all. Hey, Pakeer, it looks like the video was taken down. Senshi… I just tried the video embedded in that article… it played OK for me. I just downloaded v926 64 bit MMD and I tried adding MME but it gives me an error when adding the files. What’s the problem? I also just fixed the dll 43 error and it won’t let me fix dll 32 unless I pay it and I can’t I’m stuck and don’t know what to do…. Download the official DirectX 9.0c from Microsoft! NEVER download DLL’s from other sources!